Amanda’s note: I don’t know if you guys are crazy about dandelions, homemade vinegar, or both, but the post here on dandelion vinegar before Easter became one of the most-pinned posts on this site for its first few days out (and that was even as we were all busy with Easter brunches and other such things). 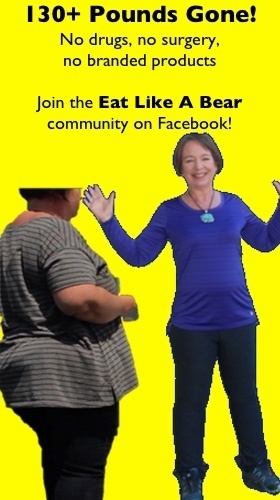 With such success I asked Carol to tell us more about her process for making culinary herbal vinegars. She’s been a trained herbalist for over two decades, so her words have a depth of experience behind them. You’ll find more from Carol at her website Studio Botanica. 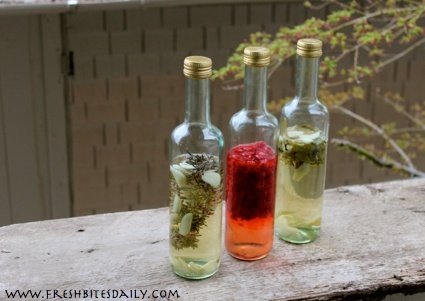 ~~~I am a big fan of infused vinegars. What can be easier than popping some plant material into a jar and topping up with vinegar? The sky’s the limit ~ culinary herbs, spices, wild flowers and a myriad of vinegars possible. One can make “simples” (one plant per bottle) or dream up interesting combinations of herbs that seem to work together and experiment! “Simples” can be stored as individual bottles and then blended later if a particular flavour profile is needed. I make a few like this, especially at the beginning of spring. As more choices become available and I am running out of jars, I get more creative and start to combine possible new LOVES! There are some famous concoctions as well. Think about the cuisines of the world. What herbs and spices does one often notice as common blends? I like to make sage, rosemary, parsley, and thyme, for example, which make a marvelous meat marinade. Basil vinegar matches well with tomatoes and a light olive oil. Try glorious opal basil and create a deep purple hued vinegar. These tasty odes to proverbial pucker power can transform a meal. They make fabulous marinades for meat or fish. Vegetables enjoy a quick toss in flavoured vinegar too. Make an extraordinary vinaigrette for your next salad. Take it a step further and add a splash of pungency to a sauce, stew, and casserole or to a summertime soup. Have you ever seen the glorious pink of “chive vinegar”? This delicate, slightly pungent onion-y vinegar makes delicious vinaigrette or marinade. The magenta of the sweet chive flowers transform this vinegar into a showstopper! I can’t wait to make that one this year. It’s always a small bottle due to limited chive flowers, and doesn’t last long. What vinegar is best? I often use apple cider vinegar but there are many times when you may prefer white wine vinegar, Champagne vinegar, red wine vinegar, or rice wine vinegar. I don’t use the plain white vinegar, personally unless in a cleaning/cleansing product for kitchen. White vinegar and lemon make my windows shine! Rule of thumb? Delicate tastes may do best with the white wine, Champagne, or rice wine vinegars. Experiment to find out what suits you. Certainly these are best if you want to see the gorgeous colour change when using a pink or red botanical. Combine fruit with the herbs and you have a gourmet treat to share with your family to give as a delicious gift. Raspberry goes well with rosemary, for example. Garlic pairs well with rosemary, or cilantro, or thyme. Basil combines well with strawberries too in a classic marriage of tastes. Combine other fragrant botanicals such as coriander seed, cumin, or ginger root to further augment the levels of scrumptious! There are so many more ideas! You decide. 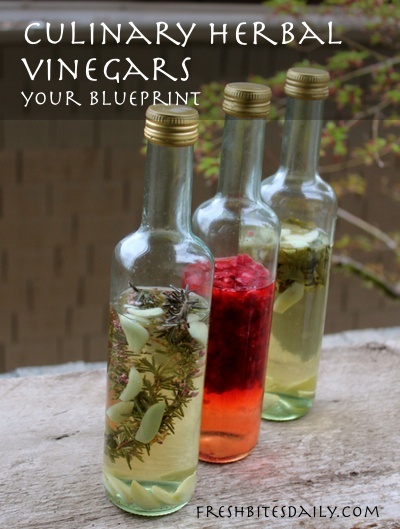 Want to try some tasty herbal vinegar this spring or summer? Pick your own favorite herbs and make some vinegar! Start with a clean bottle or jar. If using garlic, ginger, or garlic ~ drop in next. I use a chopstick or a bamboo/wooden skewer to poke at the herbs to settle down into the jar. Add the vinegar to 1/2 inch below the top of the container. Use the chopstick or skewer to poke at the herbs to ensure that they are completely submerged. If using parsley or other leafy herb; add last so that the spices will stay submerged in the vinegar. It is actually ready at this point but the infusion will be more flavourful if allowed to sit for 4-6 weeks. NOTE: if the vinegar is topped up after each use, to ensure that the botanicals are not exposed to air, the vinegar will keep for up to 6 months.